BlackTrax Delivers Technology Solution to Marvel LIVE! Iron Man, The Hulk, Captain America, Spider-Man and 20 other action heroes are all coming to different arenas around the nation – and as a part of Feld Entertainment’s Marvel Universe LIVE! CAST BlackTrax motion-tracking solution is bringing these favorite Marvel comic characters to life. Marvel Universe LIVE! is out on tour this month after debuting in Tampa, FL, premiering at New York City’s Barclays Center on Wednesday, August 13 and visiting 85 North American cities in its first two years before coming to the United Kingdom,with other global destinations to be announced. 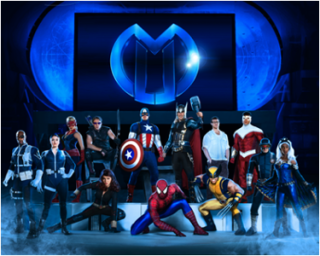 Produced by Feld Entertainment, this multimedia production sees the Avengers, Spider-Man and members of the X-Men in a live production for the first time. As expected, stunts, high-tempo action sequences, pyrotechnics and special effects are all part and parcel of the show’s design. But Marvel Universe LIVE! and its special visuals are amplified by BlackTrax. BlackTrax is the realtime tracking technology solution that delivers precise streaming 3D & 6D positional data to electro-mechanical controllers for targeting the connected automated robotic technologies already used extensively in event and entertainment production, and houses of worship. Using proprietary IR and RF, BlackTrax delivers dynamic streaming positional data with up to six degrees of freedom to 3D & spatial audio, automated lighting, multimedia servers, and robotic cameras – all at the same time, in realtime. Any object or performer tagged with the FCC and CE certified BT Beacon, which comprises a gyroscope, accelerometer, and tiny wireless radio, to which an IR LED is attached, is tracked inside the predefined space at over 100 frames per second by multiple overhead BTCameras. The orientation of the object/performer is communicated by RF directly to the BTServer. The BTBeacon’s inertia measurement unit provides redundant 3D positioning via its tiny radio transmitter should the IR line-of-sight between the BTBeacon and BTCams become obfuscated. MODE Studios’ Bob Bonniol was hired by Feld Entertainment to handle video content and system design for the show, and whose previous live-event credits include Blue Man Group in Las Vegas and Electric Zoo NYC. “We knew from the beginning that we needed to track scenic elements and characters to create the convincing scenic locations and combat effects that would amaze the audience. I felt from the start that BlackTrax would be the answer,” comments Bob Bonniol. The reason for Bonniol’s enthusiasm is not hard to see. By attaching BlackTrax Beacons to cast members, Bonniol and his team use the dynamic positional data of each Tracking Point (there can be nearly 200 unique Tracking Points onstage at any one time; each has an unique tag number used to establish a relationship with downstream technology). Tracking Points provide accurate target data for the d3 media servers used to drive the production’s projection-mapped backdrop. The BlackTrax and d3 development teams worked together for this show, taking d3’s existing advanced projection simulation toolkit and integrating BlackTrax as to track data across enormous resolutions with accuracy and limited latency, while still be manageable by the user. d3 servers were also used for parallel series of scene changes in show lighting. Indeed, BlackTrax, working through Martin Professional Consoles, made it possible to use automated lights that pull zoom and iris (rather like spotlights) to track performers automatically from places where it was imprudent or unsafe to put follow spot operators. Bruce Freeman, Chairman, CAST Group, believes industry gurus are only beginning to imagine what the BlackTrax Solution can do: “Early adopters like Feld Entertainment realize they can leverage new technology for competitive advantage and profit -- change the way they deliver their business to set themselves apart, which is exactly what we see first with Marvel Universe LIVE!. As well as enhancing WOW, BlackTrax increases the operational efficiency of a large-scale arena show tour such as Marvel Universe LIVE! that depends heavily on the prowess of its technical team that brings rigorous stopwatch process to setups and strikes – the only way to pull-off the rigorous touring schedule. As Freeman explains, “BlackTrax pays for itself. On one hand, BlackTrax is a tool that shaves hours off setup time by using its proprietary automated calibration functions for numerous BlackTrax cameras, d3 media servers and projectors, plus more than 75 automated lights paired to BlackTrax. It is vital they share the same 0,0,0 for delivery accuracy.